Propels the plot forward significantly plus fantastic ending! The Walking Dead graphic novels must be read in order and to summarize any part of this plot will be SPOILERS for the previous volumes. So reader beware! Uneasy lies the head that wears the crown… Rick decided, after consulting with Negan, at the end of volume 25 to build an army within his group of three groups. 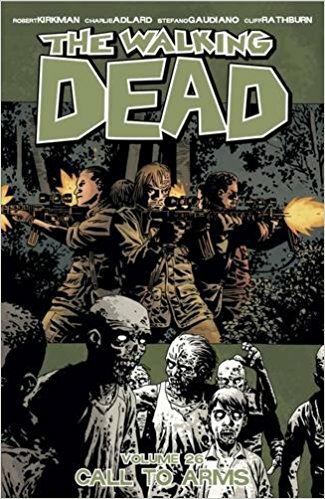 In this volume, he starts purposefully using anti-whisperers propaganda to veer the citizens’ minds away from blaming him for the deaths during the last volume. It doesn’t work for one person who is out for revenge. The plot seems to move faster than usual as many different balls are in the air. The ending is a real shocker that was a total surprise. I would highly recommend this volume if you are a reader of the series. I have to admit that I almost stopped reading the series around volume 17 but now I’m glad I didn’t. Volume 26 is a compelling read that is not to be missed!